On February 1, 2009 in Super Bowl #43, the Pittsburgh Steelers faced Arizona in the Cardinals first Super Bowl appearance. The opposing QBs that day were 37-year-old Kurt Warner for the Cards and 26-year-old Ben Roethlisberger for the Steelers. At that time, it was the first time that the age difference of the starting QBs in the Super Bowl was more than 10 years. This year’s Super Bowl will be the second time… and it will also break the record for the largest age difference in starting quarterbacks in the game’s history. Denver’s Peyton Manning will be 37 (and 315 days) old when the Broncos take the field in Super Bowl #48. His counterpart, Russell Wilson, will take the field for the Seahawks at the age of 25 years and 65 days. That’s an age difference of 12 years and 250 days. Following are the seven Super Bowls where the age difference between the starting QBs was eight years or more. * In the six Super Bowls prior to the upcoming game where the age difference in the starting QBs was eight years or more, the younger QB’s team won four of those games. * In the 26 Super Bowls where a 20-something QB faced off against a 30-something QB, the 20-something QBs have won 14 of those 26 games. 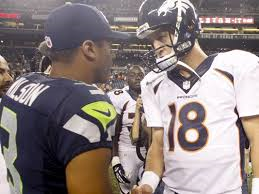 * In the 47 Super Bowls to date, the older QB has defeated the younger QB in 24 of the 47 contests.